Graphics of tools and other utensils for the workshop in flat design. 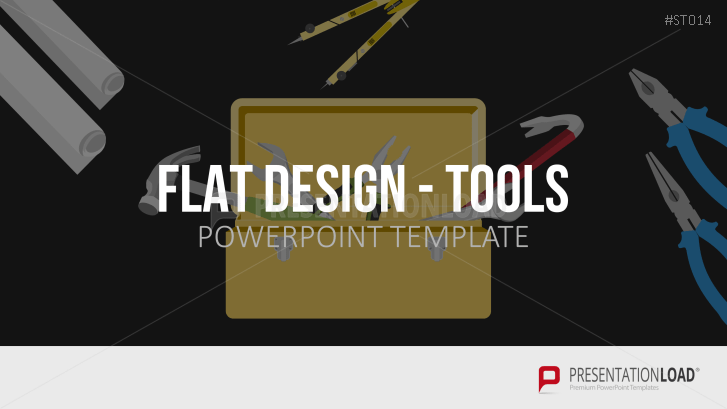 Compasses, hammers or saws- this set for PowerPoint includes graphic tools and small machines for the workshop in flat design. A paint bucket with paint brush/ roller, a compass with pencil and calculator, a variety of devices such as a drill, circular saw or hot glue gun as well as various screwdrivers, pliers, putty knife and more are all found in our set, ready-made in flat design motifs. Our flat design is characterized by simple geometric shapes, sharp color contrasts, and custom fonts. Due to its minimalist, uncluttered look, this style is often used when creating websites and is equally suitable for presentations and graphs. With our “digital toolbox” for PowerPoint, you can select from a full range of design elements for future projects.